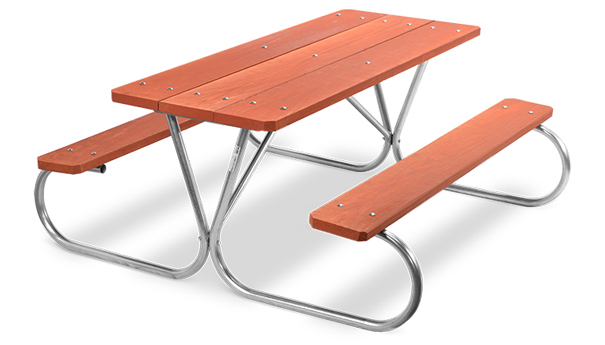 Park King commercial picnic tables are simple and efficient outdoor tables perfect for parks and rest areas. Tables have comfortable seating and excellent weather and vandal resistance. 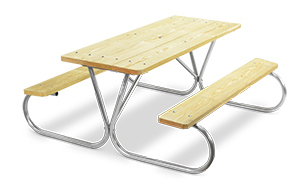 Featuring the same high quality construction as the other Belson picnic tables, the Park King commercial picnic tables are ideal for all recreation and industrial facilities. Frames are constructed of 1-1/2" O.D. galvanized tubing, and the table bracing is also galvanized for maximum corrosion resistance. Frames can be purchased separately for replacements on already existing tables or as a complete table for new installments. Tables and frames come standard in 6' lengths. Some assembly required.